Christmas festivities are always fun in Chicago. Christmas vibes are personally my favorite and although finals are coming up, it also means Christmas is! 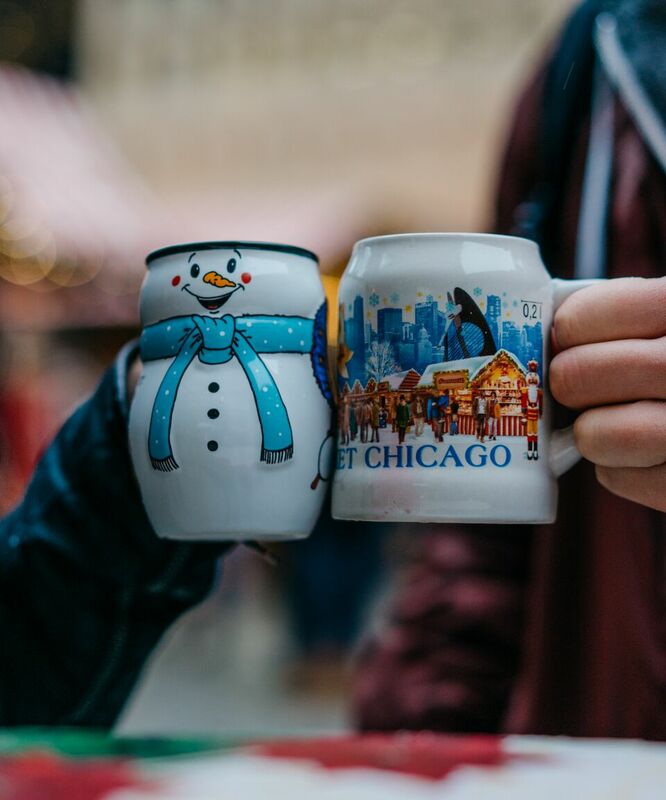 A lot of students at Loyola are not from Chicago, and something to definitely check out before you leave for the holidays is the 22nd Annual Christkindlmarket in Downtown Chicago! This market is inspired by the Christkindlesmarket in Nuremberg, Germany, which began in 1545. 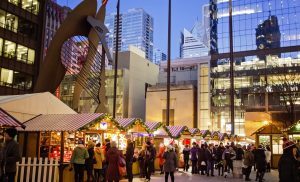 The Christkindlmarket Chicago brings a cherished German and European tradition with international flair and local charm to Chicago. Chicago’s largest open-air Christmas festival was first held on Pioneer Court in 1996. By special invitation of Mayor Richard M. Daley, Christkindlmarket Chicago moved to Daley Plaza in 1997 and has become a staple event on the plaza ever since. With the support of the City of Chicago and the Department of Cultural Affairs and Special Events (DCASE), Christkindlmarket Chicago has grown to become one of the most popular winter attractions for locals and tourists alike. Each year, people from all over the world visit the Christkindlmarket. The outdoor market in the Chicago Loop has become so popular and loved by everyone that any Chicagoan will tell you that they could not imagine the city without it. The Christkindlmarket is no longer just a German tradition, it has become a Chicago institution. The unique shopping experience, typical German food and drinks, as well as diverse holiday entertainment make the Christkindlmarket Chicago a preferred and popular destination. The best part of it, is that admission is FREE! The Christkindlemarket also has 2 other locations in addition to the one at the Daley; there is one in Naperville and at Wrigley! There are also educational opportunities as it is the perfect event for teachers and professors of the German language to take their students. At the Christkindlmarket, students have the opportunity to practice skills at the market with numerous German speaking vendors. Several educational activities for students visiting the market include:scavenger hunts, interviews with vendors, or singing German holiday songs for all to enjoy. At the market, students get to experience authentic German traditions without having to travel any farther than the city of Chicago or Naperville. Children can become members of the Kinder Club, a program that gives them opportunities to win prizes as well as get more involved in the history and tradition of the Christkindlmarket. From Kindergardeners to graduate students the message is loud and clear: The Christkindlmarket is fun! Enjoy yhe wide range of articles include eclectic ornaments that are hand-blown and painted, and cannot be found anywhere else besides the market. Classic German products like nutcrackers, cuckoo clocks, and beer steins are always popular items with visitors, too. In addition, the vendors offer toys for all ages, jewelry, clothes, home décor, and wooden handicrafts. Some vendors even demonstrate how their handicrafts are made at the market, for example, a wood carver demonstrates his unique carving technique and visitors can purchase his creations directly from the workbench. The most popular bits and pieces offered by the vendors are the large assortment of savory and sweet foods, drinks and candied treats. Visitors can smell the tempting aromas from the sausages, potato pancakes, Strudel, and many other delicacies throughout the market. Glühwein, a traditional German holiday market hot spiced wine, has been perfected to please the palate and warm the heart. This beverage is so special that it comes in a souvenir cup shaped like a boot, decorated with the market’s signature logo and year. German beer that will quench any thirst also flows from the vendors’ tap. The assortment of roasted nuts, sweet cakes and pastries, or German chocolates and candied goodies are sure to leave all sweet-toothed visitors satisfied. 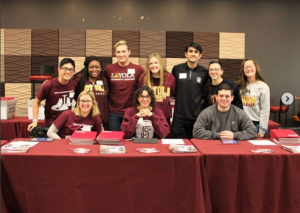 One of the many things that makes Loyola so awesome is the fact that many registered student organizations create and plan fun events for everyone to enjoy! Just about every day, students have the option of attending organizational meetings, listen in on speaker events, doing activities, and so much more. 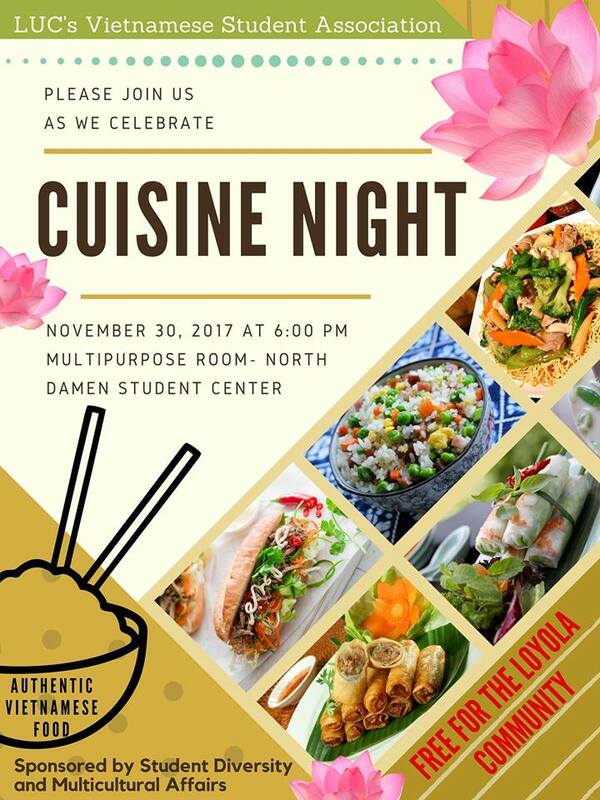 I am a part of the Vietnamese Student Association (VSA) and we have been planning for months to bring to the Loyola community, our biggest and most anticipated event scheduled for this Thursday (tomorrow)- Cuisine Night! 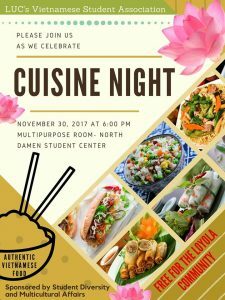 This event consists of several popular Vietnamese dishes, including an array of banh mi, spring rolls, egg rolls, fried rice, tofu, noodles, and so much more. VSA hopes to bring the Loyola community a different and tasty experience of Vietnamese cuisine and though you could visit any of the restaurants on Argyle (Viet Town), this event allows you to sample everything, not just one dish alone! In addition to food, we will have a main presentation to talk about Vietnamese foods, their origins, literal translations, and also feature fun and interesting facts. In the later half of the event, we will have an interactive game of Kahoot with our awesome interns to test people’s learnt knowledge from the presentations. Altogether, this event is one our most anticipated events as we have planned so extensively for. Why, you may ask? During our student organization fair back in September, we asked students to fill out a short survey and vote for events they were most interested in. Cuisine Night was the most popular and understandably so- who doesn’t like a food-focused event?! With that being said, this event is TOMORROW, Thursday, November 30 from 6pm-7:30pm. It is a free event for current Loyola students and for non-Loyola students, it is simply $2 for admittance. I hope to see all of you there and if you see me, don’t forget to say hi! I am not sure how useful this will be, given that there are a lot of other packing lists out there and really packing is an activity of individual choice (or art form), but I thought I should tell you what I think you should do. Of course, again, this list won’t cover everything – I’m not going to tell you to bring this or that or you MUST bring whatever, just some pieces and explain why. Before I start, I have to tell you a little about Italian – and Roman – fashion. They are big on this idea of ‘bella figura’, which literally means ‘beautiful face’ but really refers to this whole sense of presentability. Italians wouldn’t go outside with wet hair from their shower, or wear flip flops in public, or even let themselves cry where strangers can see them. This helps the Roman public transportation system be less full of strange people and odd encounters like you might find on Chicago’s L system, but Americans are used to people’s eyes sliding over them like oil on water. Not so here. Italians love to stare, and aren’t shy about it at all. So if you leave campus in a Hawaiian shirt, flip flops, and sport shorts, you are going to get some weird looks. And you might get that on campus too, since plenty of Italians work on campus, and even more students pick up on Italian fashion propriety during their time here. Also, they love dressing for the season, not the weather. Romans broke out their fall jackets and stylish leather boots as soon as October hit, despite that it was still quite warm and sunny like summer. They just dealt with it. Meanwhile the JFRC students were still walking around in shorts and tank tops. So if you want to not blend in with a crowd of tourists, don’t only pack warm weather things. So, let’s also be real. You’re probably going to travel on the weekends. You might just stay in Italy. You might be jetsetting off to every Scandinavian country every weekend. Either way, it will be cold. You will be cold. Bring warm jackets or sweaters. Bring long pants. Italy has part of the Alps, you know. And the longer you put off that Berlin trip, the more you forget that Berlin is more or less at the same latitude as Minnesota. It will probably snow. My advice for you, in list form. Mind, I have friends here with only two pairs of shoes and friends with eleven. It’s up to you. First, shoes. Don’t bother bringing heels, unless they are wedges. Cobblestones, my dudes. Bring autumn boots that are warm, and sandals that don’t take up a lot of space. Make sure every pair of shoes you own are very comfortable to walk in. I also suggest flip flops or slip-on comfortable shoes for the hallways and the IC late at night. Bring a pair of shoes that go with everything and look just a little bit nicer for those fancier dinners or when you want to feel good. Second, pants. This was a really big dilemma for me, okay? In the end, I just brought one of everything. One pair of dark jeans, one pair of light jeans, one pair of capris, one pair of black pants, one pair of shorts. One maxi skirt, for people who wear skirts, one set of leggings, for people who wear leggings, and one pair of khakis. That way, I am ready for anything but also must shake up my wardrobe more than I’m used to. Usually I just wear jeans all the time, but a pair of black pants instantly make an outfit a little nicer for those judging Italian nonnas on the bus! I also brought two pairs of workout pants, one pair of workout shorts, and one pair of warm pajama pants. The shorts doubled as my pajamas during the really hot nights. They still do when I can’t be bothered to do my laundry promptly. It’s two euros for a load! Wow! Layers! And not heels! Third, tops. I’m afraid my experience as a woman will shine through here because I don’t really have any advice for guys or people who dress however they want (although if you dress not according to fashion or gender norms, I’m assuming you probably have a better sense of your own fashion than anything I can help you with here, except maybe temperature advice). 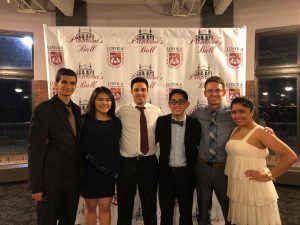 For guys, most people here at the JFRC dress a little nicer than they might at home – I’m talking button-downs, sweater vests, sports jackets sometimes, sweaters, polos. T-shirts of course, but less frequent. For ladies, I’m going to say: bring what looks nice and what you like, but bring pieces that can be layered with jackets or cardigans and that can go with two or more pants. Patterns are nice but generally serve as accents here rather than complete looks. If every top – or most of them – can be worn in chillier weather and in warmer, and is not very summer or very winter, you should be good. Keep in mind that colors get darker as the days do too. By now, everyone is in dark shades of what they were wearing light and bright just three months ago, if that affects your choice of jacket or shell. This same sort of ‘can go with multiple things’ applies to jewelry or accessories. They take up a lot of room for being things you can find here or on your travels as precious and valuable souvenirs. I know I came with two scarves, but here I am having bought three more, and I only wear my new ones. What did I need the first two for, then? Well, I hope this helps. As always, if you have any questions, just let me know! This is Grand and State. Doors open on the right at Grand and State. Hey everyone, welcome back to the fourth installment of Explore Chicago CTA Edition! As always, I’m your blogger, Miguel Molina! Today, we are going to be having some fun with both eats and treats down at the CTA’s Grand and State stop. Be sure to bring your student ID card, ventra card (u-pass), and as always, a hungry belly. So come on, let’s go and explore! There are three ways that I would recommend getting to Grand and State, depending on where you live and with time considered. The first way is the easiest. You can take the CTA Red line down from Loyola straight into Grand and State station (toward 95th). This may take around 45 minutes, give or take. Or, you can take the Intercampus shuttle from the Lakeshore Campus to the Water Tower Campus and take the El from Chicago and State toward Grand and State (only one stop away). Lastly, you can always take an Uber or a Lyft, depending on the size of the group you are traveling with, and what time of day you are planning to visit the area. After-Words Bookstore: Books are the portable doors that bring you to amazing worlds. Whether you are interested in the poetry of Jorge Luis Borges, the fiction novels of Margaret Atwood, or get wrapped up in the magical realism tendencies of Isabel Allende; After-Words Bookstore is the place for all bookworms to enjoy and savor. When going to the bookshop, the store itself is like a book. At first glance, the book’s entrance and facade looks small and unassuming. Even the first floor is unassuming with mostly children’s books and adolescent novels. However, once you take a flight of stairs downstairs you will find shelves upon shelves with new and used books from a variety of genres and authors. The store closes at 10PM, Monday-Thursday and 11PM, Friday and Saturday; meaning you can enjoy these books longer! Just be sure to tell all of your friends that you are booked for this weekend! Holy Name Cathedral: When first seeing Chicago’s Holy Name Cathedral, I find it striking to see how simple it looks on the outside. But, when you enter this structure, you will find how it is a treasure to behold. Built in 1874, Holy Name is exemplary of Chicago’s beautiful and functional architecture. This is a place for all to visit, Catholics and Non-Catholics alike. When you are visiting, be sure to check out some of these attractions in the church: the bronze doors (which weigh over 1200 pounds each); resurrection crucifix at the front of the altar; the pipe organ at the back of the church; and of course the glittering stained glass windows that line the church’s sides. Still hungry and looking for more to visit? Be sure to tune in next semester starting January 23, 2018 as we go and start to explore the north side on Fullerton on this edition of Explore Chicago CTA Edition. Doors closing. After 5 dedicated years to Loyola, Tivo is retiring from his service as the school’s therapy dog. On November 15, he has officially retired and has ushered in a new therapy dog for the job, a one year old, mixed breed puppy named Santos. Santos got his name from Reverend Scott Hendrickson SJ, a Spanish professor here at Loyola University Chicago. He wanted to incorporate the Jesuit tradition and St. Ignatius Spanish heritage in naming this furry, friendly saint. 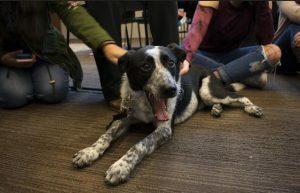 Therapy dogs are very helpful for both students and faculty members. These loving dogs assist students by acting as a counselor, an instrument for dealing with stress, trauma, or anxiety. Similar to his predecessor’s, Talk with Tivo, Santos will also hold his own therapy session called Sit with Santos. Here, students will be able to pet and play with the therapy dog while helping and assisting the counselor. Members of the Wellness Center also believe that these dogs are helpful in giving comfort and provide students with reminders of home. The dog brings back fond memories for these students. In addition to helping students, Santos also graces students with his presence at many special school wide events. For example, students can find him at the finals breakfast or at the study day stress break event. Be sure to catch him the next time you are at Lakeshore Campus! Living in Rome is so much fun, and living in JFRC certainly helps make it so! Whether you go meet a Swiss Guard with Father Al, see St. Ignatius’ rooms where he stayed when he was in Rome, or go on a gelato crawl with the SLA’s, there is always stuff to do if you’re on campus! Of course, you’re always welcome to do things with your friends, such as movie nights, going out for aperitivo, or just hanging out, but here are some of my favorite things that I’ve done that were organized with the whole of campus! It’s not a full list by any means, and it’s just the things that I’ve done – who knows, when you get here, they may do the same things, and there may also be new and more exciting things to do! Also, this is not including various so-called ‘Study Trips’ that you can sign up for at the beginning of the semester. These opportunities pop up every week! 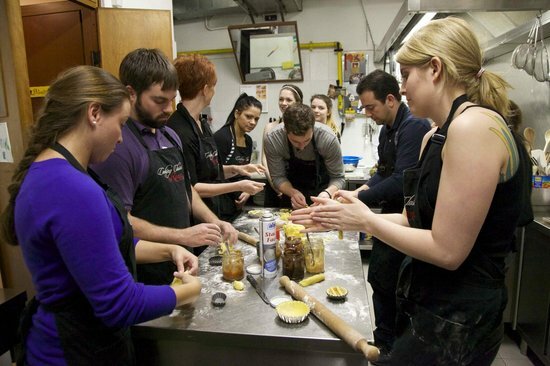 First off, I have to tell you about my time at a cooking class here in Rome! 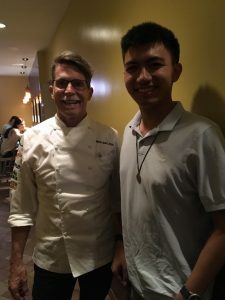 We went a specialty location run by the people at http://www.cookingclassesinrome.com/ , where in just three hours we 25 students made food enough for forty with our own hands, and ate it too! From the Roman specialty pasta alla carbonara to home-made tiramisu, it was all delicious! And, it was only twenty-five euros, which is cheaper than what I would pay for a five-course meal like we had! We also made meatballs, and an artichoke contorno. Second, I loved getting a meal with Father Al – I know I mentioned him before in meeting a Swiss Guard, but he also enjoys taking students out for pizza at a local neighborhood restaurant – on the Campus Ministry’s budget! And Father Al is a kind and generous – and interesting person. An Italian meal typically lasts hours, but with him and the other students as company, it just flew by! Third, Dr. Andrews who is the Director of the JFRC, has an adorable dog named Bacio who is here every Tuesday and Wednesday for about four hours for students to visit as they please. He’s not really an organized event, per se, but he sure is cute. And more dependable to find than the JFRC cats! Fourth, I love everything that the Student Activities Committee does! You can get involved too. SAC does a couple of annual events per semester, such as organizing a town hall meeting for people to suggest ways to better the community and the campus, a talent show (where yours truly aided a rendition of The Devil Went Down to Georgia by playing the air-fiddle, another girl juggled mozzarella balls, and the SLAs and Dr. Beazley, Dean of Students, performed a cheer routine), a silent auction wherein all proceeds go to charity, and more! SAC provides fun and free ways to be involved on campus. And fifth, I’d be remiss if I didn’t mention Calcio! Calcio is the Italian word for soccer, or football as it’s known to the rest of the world, and Calcio unites us like no other. There’s a myriad of teams, usually six, that play against each other every week and then go out for pizza and beer together after! Of course, there’s no obligation to show up every week, but a little friendly competition lets you meet people and get to know them while working off the steam of academics! And if you’re not athletic, that’s okay too. 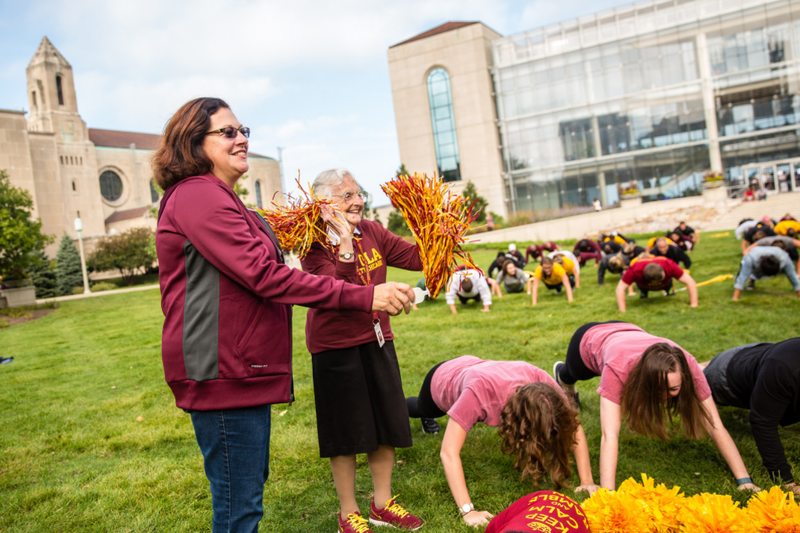 The spectators have a lot of fun as well – this semester, each team has an unofficial ‘team mom’ who leads cheers, brings snacks, and is all-around the dependable fan. And if you’ve got a wide social circle, odds are your friends will be on different teams, making the nights when they go head-to-head ones to remember! These are just a small sample of what’s to-do and what’s been done here at JFRC. What will you do? Perhaps you are still new to Loyola and don’t know about some internal famous people at Loyola. The first person on the list of famous people would be no one other than… Sister Jean! She is a living legacy here at Loyola University. 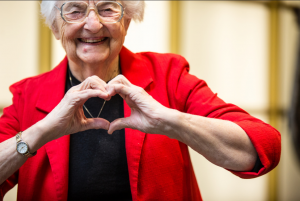 At the current age of 98, she is an active nun and member of the school. 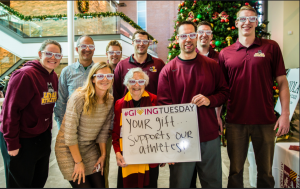 Sr. Jean also participates in athletics too, being the guide for the basketball teams. She helps teammates focus on their academic and personal development and also sends them personal emails after the games. She was born in California but came to Chicago later in her life. 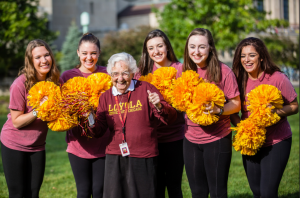 In 1961, she accepted a teaching position at Mundelein College, an all-women institution (now Mundelein is a part of Loyola University). In 1994, she became the basketball chaplain and become highly involved with the students in community work and participated in all the religious events on campus. She even handled out prayer cards to students during finals week, one point in her life. Though she may be old, she understands the students and has a youthful personality and a sense of humer. “Bopping around the sidelines in my Nikes and trifocals, standing 5 feet tall, I’m towered over by the athletes, but they treat me like a queen,” she says. To say in the least, the students, staff, and faculty all love her very much. We tend to think she gives off positive energy and good luck too, so even seeing her or saying hi is enough for us to feel better. 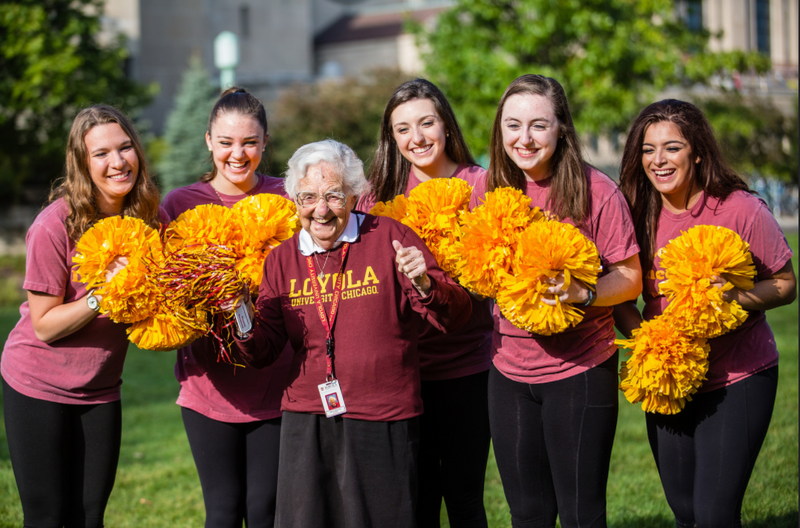 She is currently responsible for the SMILE Program (Students Moving Into the Lives of Elderly), a partnership between Loyola students and residents of The Clare Retirement Facility. In her Regis apartment, she conducts a weekly Prayer Group composed of students from various halls. To say in the least, Sr. Jean doesn’t let her age stop her from serving the community of all ages! Please continue to pray for Sr. Jean, especially at this time! Her work and energy is always appreciated and she is the key model to what our school spirit is all about! Did Someone Say Free Breakfast?! Pakistani Students’ Association (PSA) hopes everyone is ready for the Thanksgiving holidays. As we approach the end of the semester, things can be quite stressful, but that is why PSA is inviting you to yet another exciting event! To celebrate a successful semester and to thank you all for your support, BREAKFAST IS ON US!!! 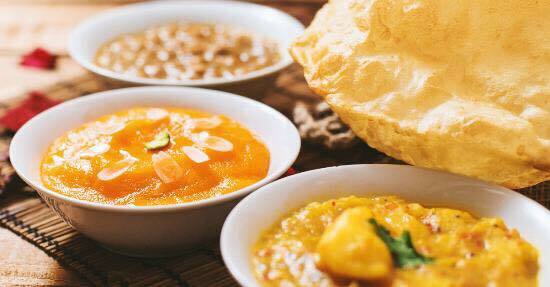 We will be serving Halwa Puri with Aloo and Cholay along with Kashmiri Chai. For those of you who are unfamiliar with this popular Pakistani breakfast, halwa is a sweet that comes with a deep fried bread (puri) and is typically served with potato (aloo) and curries mixed of chickpeas (cholay). Bring your friends along and enjoy Nashta November!!! We look forward to seeing you all this Monday! This will be our last event of the semester so stay tuned for what we have planned next! Also if you have not done so already, please follow us on our social media! Things have been rather hectic for me for the better, I suppose. Applications for graduate school, language competency exam, 19 credits worth of classwork, VSA organization meetings and preparations for events, and other personal obligations I have. To say in the least, I am up and going! There’s a lot to do and so little time to sit back. Nevertheless, this blog is a short reflection of me during the halfway-point of senior year. Hopefully this gives you some more insight to the life of a LUC senior! For most freshman, the thought of what they will do after college is a frequent question that lingers in their minds for quite some time. As general college students, procrastination gradually become a skill and that thought of post-graduation gets put on hold. Senior year is now here for me and luckily, I have given it much thought and consideration for what I plan to do after college. I recently applied for graduate school and am mentally preparing for my last semester at Loyola. Class registration happened last week and it is scary to think that I was registering for classes for the last time. Part of me was happy finally be done with school but part of me didn’t want to leave the school so quickly. For the past 3 years, my Loyola experience was incredible. I made so many memories, good and bad, with my friends and the school. I had the privilege of taking classes with the most amazing professors and I know I will walk out of this institution gaining more knowledge and being a better person. 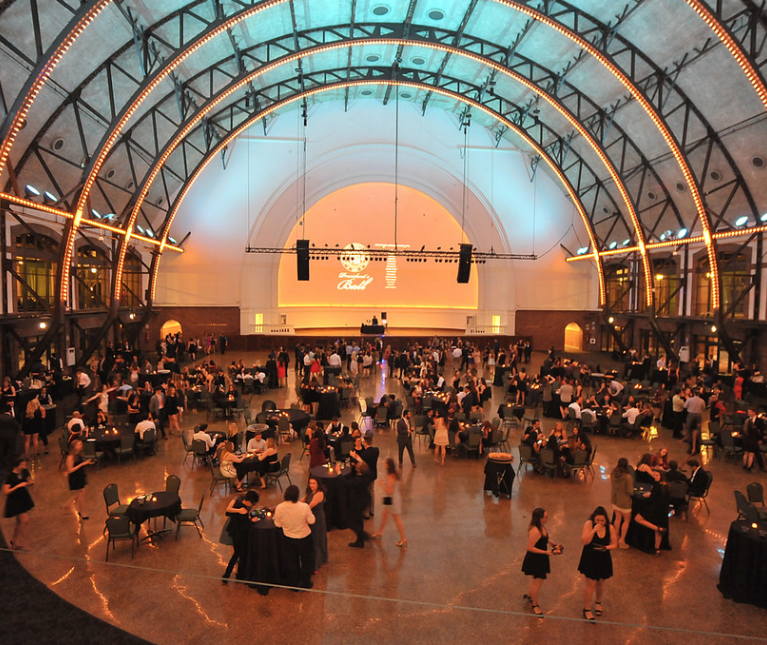 “Senior” year finally hit me when I went to the President’s Ball earlier this month. This event is for everyone, but more so geared toward the seniors. It is eye-opening to see all of my graduating class from different schools; more than half of them I did not even know or recognize! To see everyone in one room and having fun celebrating senior year–it’s a memory that will be hard to forget. 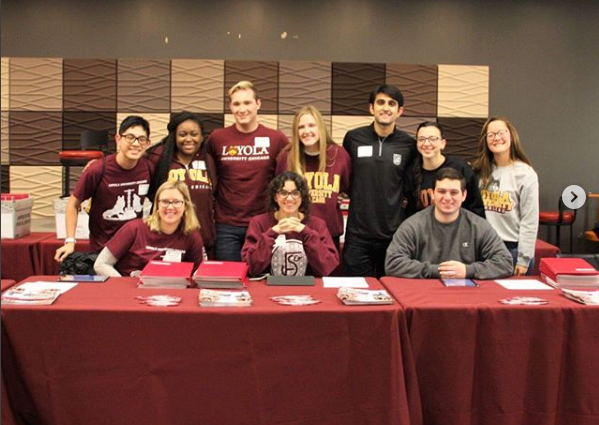 Just recently, I worked during Loyola’s Open House on November 11. During check-in at Damen Den, it just occurred to me that this Open House would actually be my last LUC Open House. For the last 3 years, I have helped promote this school and this particular event would be done for. It was great helping the Undergraduate Admissions office and I got to meet so many great student workers along the way! I am slowly preparing research to present for the Annual Loyola Symposium in April and in terms of my Vietnamese Student Association, there are SO MANY events we have already extensively planned for and are in the process of funding now. Senior year is going by fast, and sometimes it goes by at a pace that I can’t catch up with. It’s mind-blowing to know that college goes by that quickly. With that being said, I am at square one again in graduate school as a freshman. The semester is coming to a close and it seems that this is the perfect time for professors to drop all of their presentations, projects, papers, etc. on students. We are all stressed out and tired with not enough sleep. We neglect sleep and healthy eating habits and turn to RedBull, Coffee, or junk food to get us nourished enough for our next class or that infamous all nighter. Hey you, yes you! Put down that can of RedBull, unplug that Keurig Machine, stop munching away on your Cheet0’s and Doritos. 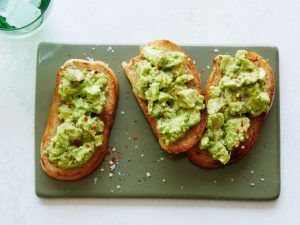 Today, I am going to teach you four basic meals (breakfast, lunch, dinner, and dessert) that you can make on a college budget. All of these recipes are healthy (Mom approved) and are super tasty (not Buzzfeed’s Tasty). Happy Eats! Check your salmon periodically to make sure the fish is cooked thoroughly; once it is ready you are ready for a healthy and tasty meal that you just made in your apartment! Once incorporated well, place into the refrigerator to cool off, your dessert is then ready to eat and enjoy!